The Trumpet Anemone Aiptasia mutabilis is one of the hardy varieties of the Aiptasiidae family. This family offers several interesting variations of anemones that are easy to care for and reproduce quickly. The Trumpet Anemone is a cold water aiptasia, however, so is not as common in the saltwater aquarium trade as its smaller aiptasia relatives. The Trumpet Anemone can easily be recognized by the characteristic color pattern of its tentacles, which are often tinted with greens or blues. It is similar in structure to its smaller and better known weedy aiptasia cousins, such as the Glass Anemone, Brown Glass Anemone, and Small Rock Anemone. Like them, it too has tons of tapering tentacles on the outer margin of its oral disc. However unlike its cousins, it doesn't retract its tentacles as readily. It is also quite a bit larger, reaching up to 4.75" (12 cm) tall. Those smaller Aiptasia anemones don't have a very good reputation with saltwater hobbyists. Scientific studies have determined that the Aiptasia have strong stings. They use venomous cells, nematocysts found in their tentacles, to sting corals and fish. They can quickly reach plague proportions in a saltwater aquarium or a reef tank, and become a real nuisance. Infestations are very hard to get rid of and the smaller species have been known to take over a reef aquarium by quickly reproducing, stinging and killing other tank invertebrates. The Trumpet Anemone is the only known cold water Aiptasia anemone. Being quite a bit larger, it is also easier to control, so it doesn't have quite the same bad reputation. However, they do have strong stings and don’t “play nice” with corals and other anemones. Use careful placement and keep other invertebrates out of their reach. The Trumpet Anemone Aiptasia mutabilis was described by Gravenhorst in 1831. The Aiptasia mutabilis are found in the cold waters of the North Eastern Atlantic, in the Mediterranean, near the Azores Islands, and from Ireland to the Canary Islands and in the region of the British Isles. This species is not on the IUCN Red List for endangered species. Other common names it is known by are Rock Anemone and Glass Anemone. The Trumpet Anemones is the only known cold water Aiptasia anemone. They will attach to stones, rubble, and other hard substrates. They also are found under rock ledges in shallow areas, and attached to wood structures as well. They feed on zooplankton and fish at depths between 0 - 65 feet (0 - 20 m). The Trumpet Anemone is a larger Aiptasia species, and can get up to about 4.75" (12 cm) tall. It is unknown how long Aiptasia anemones can live, however some anemone species can be hundreds of years old in the wild, and in captivity have been known to last 100 years or more. The Aiptasia anemones do reproduce quickly, however, and mature specimens can produce dozens of juveniles in a single day if they have plenty of nutrients. The Trumpet Anemones are somewhat translucent with an overall brown or yellowish-brown coloration, usually marked by green or blue lines radiating from the mouth. Their coloring comes from an algae called zooxanthellae living in its tissues. There are often irregular streaks of opaque white on the column, the tentacles become pale towards the tips. Their body form is the polyp. It is composed of a smooth column, variable in shape but usually trumpet-like. It is topped with an oral disc that has a mouth in the center. There are close to 100 tentacles positioned on the outer margin of the oral disc. They are stout at the base and then taper to a fine point. Their tentacles are perfectly retractable, but they rarely retract them. The Trumpet Anemone has a pedal disc or 'foot' with which it attaches to the substrate. If tank conditions are not ideal they will use their “foot” to move along the substrate. They do this by contracting the circular muscles of the foot and pushing forward. They may also crawl on their side by attaching to the substrate with adhesive spots (not easily visible) on column. 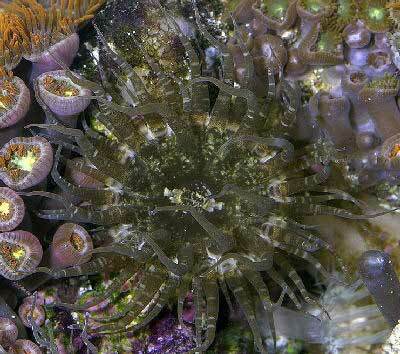 Rock anemones can be easy to moderately difficult to care for, depending upon the species. The Trumpet Anemone is moderately hardy and will do fine in most reef conditions, but it must be provided with a cold water environment. When choosing a Trumpet Anemone, make sure the color is good, the mouth is not gaping open, and their foot and tentacles are sticky to the touch. Using a very thin blunt item like a credit card, wiggle it under the foot and slowly nudging it away will get the anemone off the glass. On a rock, well, you will never get it off and you would need to purchase the rock as well. The Trumpet Anemone is a carnivore, but these anemones are also equipped with nutritional alternatives for their well-being. In the wild, Aiptasia derive nutrition from their symbiotic algae, zooxanthellae, as well as from the water around them. They use their tentacles to capture fish, mussels, and small crustaceans that happen by, then insert the food into their mouths for ingestion. They generally eat zooplankton, but will always accept other foot particles. In captivity you can feed your Trumpet Anemone chopped silversides, shrimp, krill, and mussels, fresh chopped fish (from your grocery store), as well as frozen carnivore preparations. They need to be fed 2 to 4 times a week. Feeding Frequency: Weekly - Feed 2 to 4 times per week. Water changes of 10% bi-monthly or 20% a month are typical for most anemones, yet Trumpet Anemones will flourish in poor water-quality environments that are rich in organic nutrients. Monitor your water quality for your particular situation and adjust your water changes accordingly. Waste production created by your anemone can be calculated in inches. Basically, one average sized 4" Trumpet Anemone produces a bio-load equivalent to that of 2 or 3 small fish. Purigen and Poly-fiber are great products to help in maintaining water quality. Purigen is a synthetic polymer that removes soluble and insoluble impurities from water at an exceptionally high rate and capacity, helping to control ammonia, nitrites and nitrates. Poly-fiber can be cut and used in sumps, etc. The Trumpet Anemone can readily be kept in a nano tank of just 5-gallons or more, however, the tank should be completely cycled. The typical reef environment is needed for your anemone, but it must be a cold water reef. They can be kept in temperatures from 55° to 68°F (15 to 20°C), and for this you will need a chiller. Whatever temperature you choose, it must be kept stable. Acrylic tanks are best for insulating against temperature fluctuations, and each 1/2" of wall thickness will give a thermal barrier of 5° F.
They need the same type of lighting found in a typical reef, and moderate lighting is suggested. They will thrive in bright light, but even under poor lighting aiptasia anemones will survive. Lighting from LED or t5s puts off less heat which helps with a cold water tank. They prefer a low-to-moderate water movement, but any type of movement is fine, just not stagnant water. Like most anemone species, they need live rock or some other solid material they can attach to. Any substrate is fine as these anemones will inhabit all levels of the tank. If using them in a refugium, use screening to prevent free floating aiptasia from migrating to your main tank. Be sure to have all of your pumps covered. Most good quality pumps have guards on them. The Trumpet Anemone is an aggressive anemone that can kill and eat fish, as well as other corals and anemones. Be very careful when keeping this anemone with any other anemones, corals, or fish. They are not suitable clownfish hosts and clownfish can be eaten, as can any other fish that happens by and gets caught. This is a safe ornamental anemone for most reef tanks. Just keep in mind these anemones will sting everything they can reach, like corals and other invertebrates. After splitting, Trumpet Anemones will tolerate their own “clones” and sometimes their own species. The Trumpet Anemone Aiptasia mutabilis is very rarely available in stores, but occasionally found online, and is moderately expensive. Various live Aiptasia species can also be found from supply companies that provide for research and scientific study.